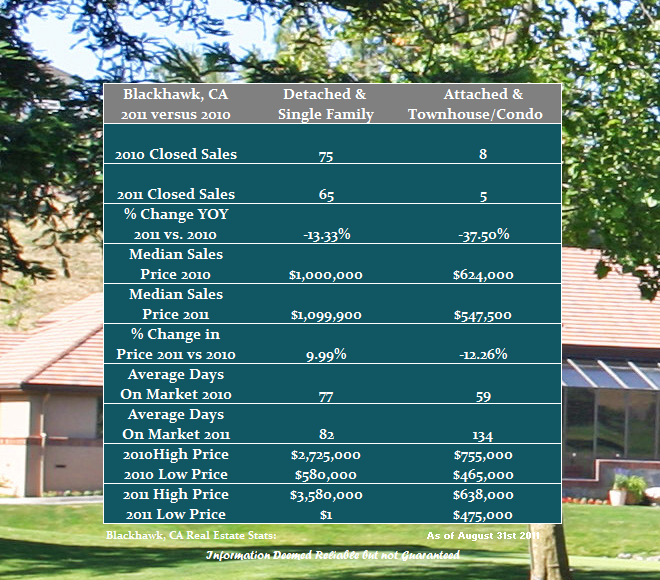 The following information describes the performance of the housing market in Blackhawk in 2011 versus 2010 through the first eight months of the year. The single family homes have posted a moderate decline in unit sales and marketing time is basically unchanged. A nice tidbit is the increase in the median sales price versus last year. Attached homes have shown a bit of weakness but the sample is small and can be subject to large variances on a month to month basis. The average days on market figures for 2011 are a little skewed since one of the sales was listed for 342 days. Share the post "Blackhawk Real Estate Market Year Over Year Report through August"